How to access back of a leaky water fill? Help! I'm reposting my question because I've now identified the leak in my 1997 T2653 camper trailer, but I don't know how to access it or fix it. Unfortunately, I can't pull it out any further than in the photo. I can see the assembly inside the wall from inside the camper. It's under the fridge and I don't think i can access it under there unless I saw apart some of the cabinetry. Does anybody have any suggestions for fixing this leak esp. accessing the pipe that is leaking? Also, ways to seal up the under-carriage vinyl I cut to clean out the wet insulation? That fitting is the "city water" supply connection. In a campground that has water at the campsite, you screw in a potable water hose to that connection and it supplies the camper with pressurized water. That fitting does not fill the onboard fresh water tank that the water pump draws from. The problem is, the gray nut is loose, the rubber cone washer in the fitting is dried up, cracked and leaking or both. 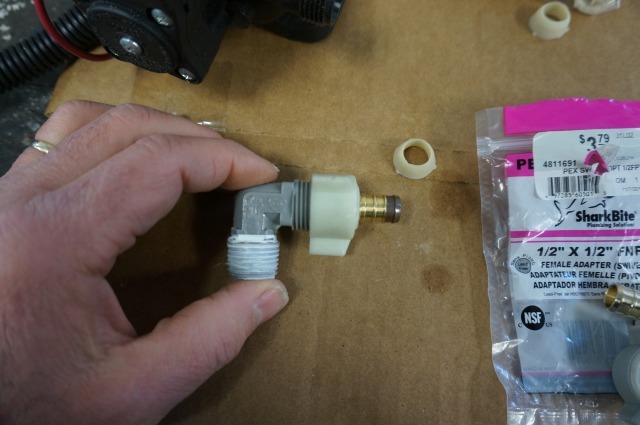 You need a new cone washer installed and the fitting tightened and it should stop the leak. You can try and tighten the nut and see if it stops, but long term be getting a new cone washer. The gray nut will unscrew from the brass fitting. Look inside the gray nut and the cone washer should be there. 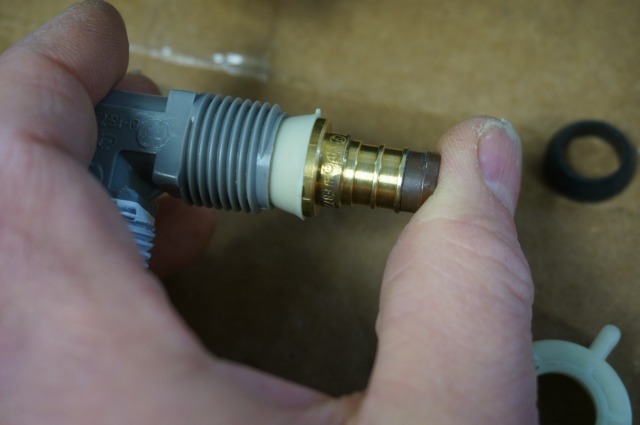 Sometimes it sticks to the PEX fitting (the gray nut part) and sometimes it sticks to the brass city water fittings. If the washer is stuck in the fitting, using an ice pick of sorts you can stab it and pluck it out. Be careful to not push the gray fitting into the wall as I do not know your floor plan if you can get to the back side to poke the water piping backout. What you are looking for is a 1/2" PEX swivel cone washer. Odds are high you will not find just the washer for sale at your local lumber yard or hardware store that sells PEX fittings. I am working on a post (in the future) on how to find a replacement cone washer but here is some help before then. Go to your lumber yard or plumbing place and ask for a 1/2" PEX to 1/2" FNPT straight swivel fitting. A straight fitting is usually cheaper than a 90 deg elbow fitting and plastic PEX in place of brass is even cheaper yet. 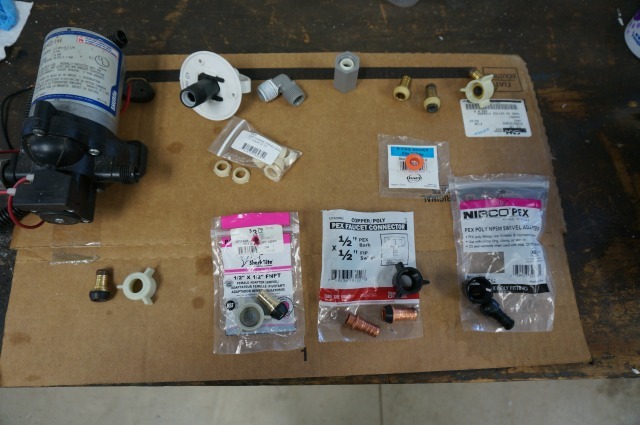 You are then going to buy the entire fitting and take the cone washer out of it and use that in your camper city water connection. The whole fitting can run between $4 to $6 bucks. 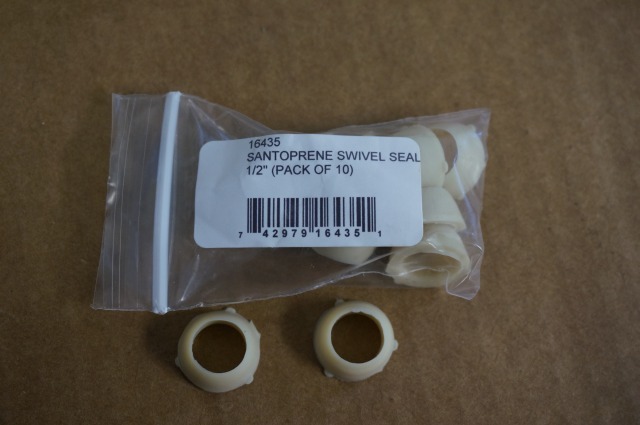 A collection of several brands of PEX swivel fittings. Here is what the come washer and fitting looks like in the wall. This is a 90 deg elbow, but the cone washer and the nut is the same as what yours is. The fitting with the nut, this brand is white where yours is gray. I have tracked down just the replacement washers, but it will take some time to get them from on line. The local lumber yard buying the whole fitting will be faster, just more expensive. This is the actual Flair-it brand replacement cone washer. It is the only brand I can find out of 6 others PEX manufacturers that sells just the cone washers as a replacement part. You can buy a pack of 10 of those Flair it washers for $0.98 cents from Amazon as an add on item, if they have them in stock. They go out of stock often. Being an add on item Amazon wants to to buy $25 of stuff sold by them and they will ship the 10 pack of washers with it. No one wants to deal with the freight of shipping 1/2 ounce of rubber cones for $0.98 cents. 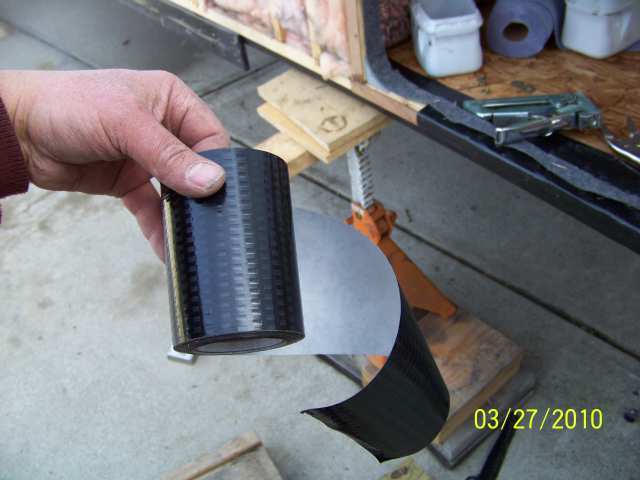 PS, when you screw the city water flange back onto the side of the camper, you should replace the sealing tape between the siding the the white flange. I use butyl sealing tape. 1/8" thick by 1" wide. It comes in a roll. 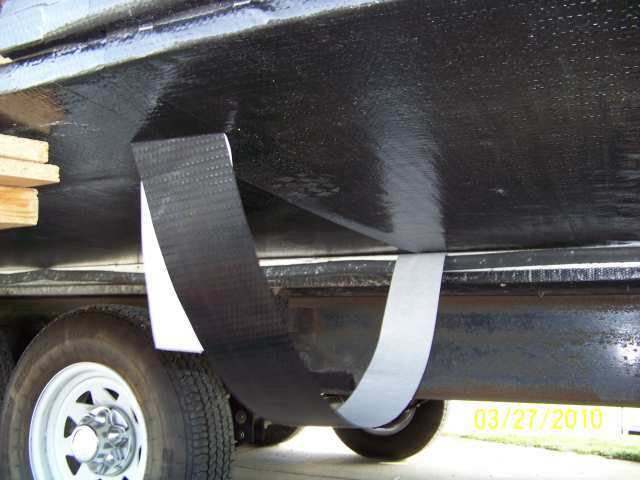 To repair the black waterproof membrane, use a product called, Flex Mend belly repair tape. It comes in different widths. Suggest going with 4" wide. Mobile home repair places have it or you can order it online. It works best if you can press it on real hard. You may have to slide something hard surface, board etc, behind the membrane to press on. That will not work for the full cut away, but will help where you can get the board in behind it. You must clean the surface to apply the tape first. Use rubbing alcohol, lacquer thinner or other cleaner that leaves no residual and evaporates off fast. Once you apply and press the tape, I have found if you gently warm it with a hair dryer or low wattage heat gun, then press it hard it will set the adhesive to make it permanent. Keep the heat moving as if you put to much heat, it will melt/shrink the tape. It should be warm to the touch, but not too hot to touch.